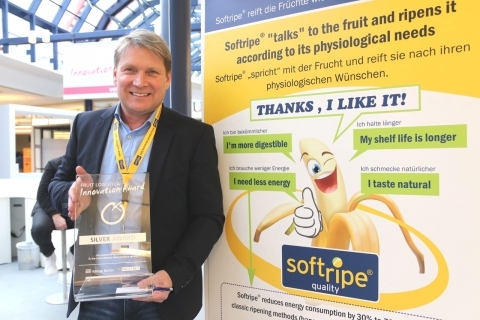 Fruit Logistica’s 2019 Silver Innovation Award was given to the German firm Frigotec for its “Softripe® Ripening Technology.” Trade visitors were impressed by this natural and energy-saving ripening technology for bananas and other tropical fruit. After winning the award, Roland Wirth, General Manager of Frigotec, sat down for an interview with Produce Report at Fruit Logistica 2019 in Berlin. The main advantage of the Softripe process is that fruit can be ripened in a relatively natural way, which has also been proven to be both highly effective and efficient. Softripe ripening is significantly different from traditional ethylene ripening methods. According to Mr. Wirth, "In traditional ripening methods, bananas are placed in a room where they are exposed to around 700 ppm ethylene. With such a heavy dose of ethylene, the bananas are stressed and lose some of their natural smell." Mr. Wirth continued, noting that, "Since bananas naturally produce ethylene, we expose them to only 70 ppm ethylene, a dosage which simply meets their biological needs and allows a more natural reaction to take place during the ripening process." Following ripening, the quality of the fruit also shows improvement. According to Mr. Wirth, not only is taste and flavour significantly improved, but shelf life is also considerably extended. He attributed these positive changes to the fact that the banana is not stressed during the ripening process, which greatly preserves the natural energy content of the fruit. Another significant benefit of this technology lies in its automatization. The computer-controlled system turns the room into a controlled atmosphere (CA) facility once the ripening process is complete, which often takes no more than three days – there is no need for staff to be constantly entering the ripening chamber to perform checks. "We simply deposit the pallet of bananas inside the ripening chamber and set a date for removal – the fruit goes through the nine stages of ripening automatically." In addition to bananas, Softripe® Ripening Technology also works well for exotic fruit, such as mangos and avocados. Mr. Wirth told Produce Report Frigotec has over 30 years’ experience in banana ripening and also enjoys extensive expertise in utilizing CA solutions for apple storage.